Super cooled. Super Accurate NH3 Application System. AccuFlow is the most trusted NH3 application system on the market— and it earned that trust delivering superior accuracy, easy operation and unrivaled reliability. Compatible with all Raven automatic control systems, AccuFlow guarantees your crops get the nitrogen they need where they need it. Precisely! Convenient cost savings. Matched with any of Raven’s spray consoles or multi-function field computers, AccuFlow delivers more accuracy over a wide range of NH3 application rates. Simply set the rate and drive—or you can VRA your NH3 application for even greater cost savings and efficiency. Pick your level of precision. With AccuFlow, you have two options to choose from based on your field conditions, desired level of performance and budget. Choose the two-valve system or opt for the fast-valve option. Either way, AccuFlow makes sure your fields are covered just the way you want them! Total control and compatibility. Superior performance takes teamwork—and AccuFlow is the ultimate team player. AccuFlow works seamlessly with AccuBoom/Switch Pro section control technology, the SideKick direct injection system and Raven’s industry-leading spray consoles and field computers. Strip tillers delight. Strip tillers love the fact that AccuFlow is compatible with multi-product controllers. Ideally suited for applying NH3 in precisely the right amount and location while you apply P and K at the same time for maximum yield and efficiency. How does it work? AccuFlow uses super cooling technology to stabilize NH3 as a liquid versus a gas for precise measurement and application. When used with your Raven control system, AccuFlow lets you apply NH3 more accurately for maximum yields, less waste and lower input costs. AccuFlow’s 30 GPM super cooler gives you the capacity you need for the heaviest, most demanding application situations for NH3. 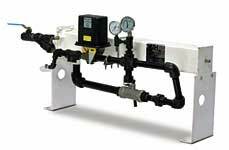 AccuFlow’s super cooler maintains the right temperature for more precise NH3 metering and application. Achieve up to six-section NH3 control with AccuFlow and Raven’s AccuBoom or Switch Pro section control technology. This combination offers more performance with every pass by automatically shutting off tool bar sections as you cross into no apply zones and previously applied areas. AccuFlow’s two-valve and fast-valve systems let you match your farming needs and budget with your desired level of precision. The two-valve option is designed with one valve to open and close the system and another to control the flow rate for industry-leading performance. The fast-valve option controls the flow rate and turns your system on and off with a single valve for trusted savings and precision. Convenient cooler disassembly means easier cleaning and maintenance for years of dependability and superior performance. Two monitoring options allow you to apply NH3 in either gallons or pounds per acre. You decide—and AccuFlow takes care of the rest. Space-Saver plumbing kits are available for both the two-valve and fastvalve systems for added convenience when space is limited. AccuFlow is compatible with Raven field computers and SCS spray consoles for maximum flexibility and more room to grow with other precision-based solutions from Raven.